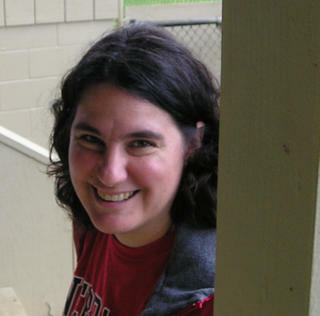 daily dose of spazz: Stampama-Who? I think it is because I am not the best stamper or very good at making things straight. With this handy little tool, I can actually line something up if I want to. So here is a handy little guide on why you want a stampamajig and how to use it. 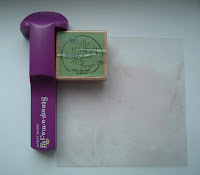 Stampamajig is extremely useful if you want to layer stamps or line up words or letters. 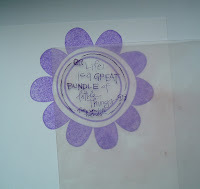 In this example, I am going to show you how to add a sentiment to the center of a flower, perfectly and easily. 1. 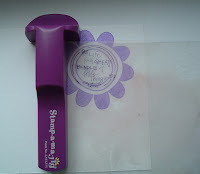 Place Stampamajig (the purple piece) flush along the left corner and then stamp lining up to the stampamajig onto the image sheet. The image sheet is that plastic square that comes with it. As you can see, mine has seen better days and should probably be cleaned. 2. As you can see, you now have the image on your sheet all ready to use on as many projects as you like. 4. Re-allign the stampamajig to the left of the image sheet. Make sure your image sheet is perfectly placed to where you want to stamp. Sometimes this moves a little in this step. 5. 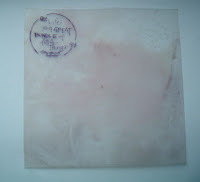 Now carefully remove only the image sheet and stamp, alligning the stamp flush with the left corner of the stampamajig. 6. This is the finished product. The sentiment is right in the center as I wanted. Without the Stampamajig, I wing it all the time, but it never looks as good as it does with this handy tool. Besides, I love that word...Stampamajig, that alone made me buy mine 4 years ago and I wasn't even sure how it worked back then. Card details: Stamps are SU! 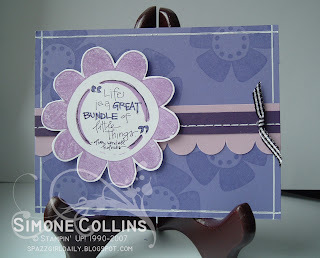 Big Blooms and Kolette Hall $1 stamp from Michaels, Colors are Orchid Opulence, Lovely Lilac, Eggplant and White, used the Mat Pack for faux stitching, Black Gingham Ribbon and the Slit Punch to make the scallop edge. I used White Signo Gel Pen and Versamark as well. I need to get a stampamajig. That is one tool that I don't own and I thought that I had many of the tools of the trade. Goo goo gaa gaa. Love it! I'm a winging it kind of gal (which probably explains my sentiments off in the middle of nowhere a lot). I have one too but don't use it and I never stamp straight. So, I guess I better get it out and use it!! thanks for showing us. This is an incredible card! LOVE IT!!!! I love your card! I use my Stampamajiggy a lot too. 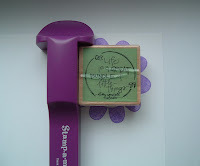 Once I learned to use it, I wondered how I ever stamped without it!